For Cody Ellingham (@cbje_tokyo), a New Zealand-born, Tokyo-based photographer who’s been living in Japan since 2012, his current home base screams 1980s – an era that served as the inspiration for the cyberpunk aesthetics of sci-fi films like Blade Runner, and gave birth to many Japanese pop culture icons. This bustling city is also the catalyst of Ellingham’s photography career, where he has over the past few years developed a style that he describes as “quiet and still.” In his acclaimed photo series ‘Derive’ and ‘Danchi Dreams,’ the dizzying neon signs and brightly illuminated buildings along Tokyo’s streets are filtered through a dreamy, futuristic façade that has become his signature, which have earned him nearly 30,000 followers on Instagram. “I like to capture the essence of a place by focusing on the architecture or cityscape as opposed to the people, but you’ll still find traces of human elements through the windows of these buildings,” explains Ellingham. Meanwhile, another recurring theme of his photography, as evident in his multi-part ‘Derive’ series that zeroes in on a particular city each time, is his penchant for capturing the essence of the past through the present. In his latest addition to the series subtitled ‘Shanghai Streets,’ Ellingham spent four days in May wandering through and documenting his first impression of China’s most populous and international city. Similar to Tokyo, since historic and modern architecture coexist almost side-by-side within Shanghai’s vast and varied cityscape, highlighting the contrast between its older elements like the lilongs around People’s Square and the former French Concession and the city’s futuristic side became the overarching theme. Another connection between Shanghai and Tokyo that has been established through Ellingham’s work is the gentrification happening in both cities in recent decades. In his ‘Danchi Dreams’ series, the photographer dives deeply into the past and present of Japan’s clustered apartment blocks, many of which are now being demolished to make way for modern redevelopments. "The fog provided an additional texture that turned the city red. In my mind, that became the color of Shanghai"
some of the remaining buildings around Tokyo. A sense of loneliness looms in the buildings’ brightly lit corridors and the wearing surfaces of their exterior. That same feeling was also captured in one of the shots in ‘Shanghai Streets’ featuring a wall of residential buildings, where illuminated windows offer a glimpse into the human life behind the concrete façade. In another shot taken at an intersection in the quiet backstreets of People’s Square, viewers are drawn into a dark visual tunnel flanked by the well-lit storefronts of a pair of old three-story buildings, with tiny dots of lights from the modern high-rises beaconing through the fog in a distance. 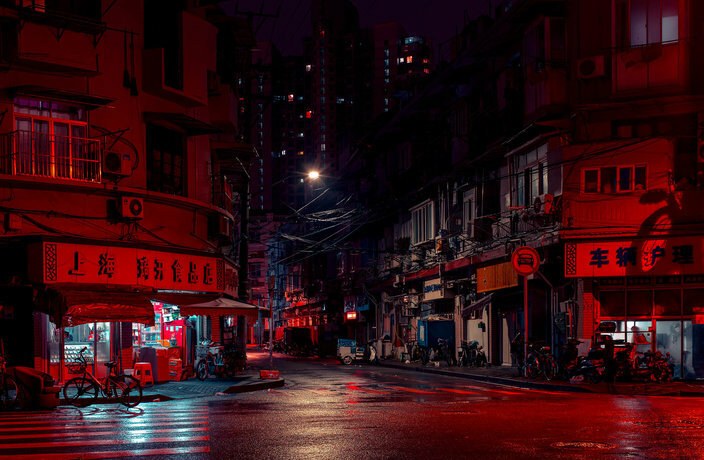 Cover image by Cody Ellingham. To see more of his work, visit his website. Photographer and digital artist Alexis Goodwin offers a unique and dreamy look at Shanghai. This year, the SWPA recognized 52 Chinese photographers altogether, with 15 Chinese photographers making the shortlist. China's first couturiere and fashion empress Guo Pei talks inspiration and gravity-defying dresses. This year's international iPhone Photography Awards were dominated by photographers from Greater China. Here, some of the best.